If you and members of your family are serious bread lovers that like making and eating your own bread, you probably have either already used a bread machine or are considering buying one. There are quite a few home models to choose from that offer different loaf sizes, a few programmable modes and the ability to make different kinds of bread. However, there are a few brands popular in the USA that make very good bread machines and they each make at least one model that comes with lots of fancy features and complete versatility while returning consistent results everytime. In this article we compare Zojirushi vs Breville vs Cuisinart vs T-Fal bread makers and have chosen the most popular high end models from each of these brands to do battle. These are not for the occasional bread eater. If you’re going to buy one of these you’ll want to use it as often as possible just because they make the whole process so easy. Why Choose a Top-of-the-Line Bread Machine? There may be many reasons that you prefer to eat freshly baked bread as opposed to store bought, like knowing every single ingredient that’s in the loaf, having great flavor and texture, and even experimenting with various ingredients so that you don’t get bored. 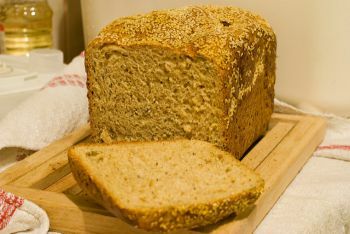 For all these reasons, having a bread machine at home can be a great investment even if you do consider pricey models. Making bread by hand is fine if you do it occasionally, but that requires a lot of time and effort, especially if you don’t have a lot of arm strength or have arthritic hands that hinder the kneading stage. The entire process also takes time, as you have to measure and mix ingredients, knead the mixture, leave the dough to rise, then repeat all the steps before the finally shaping the dough and baking it in the oven. The baking will need to be monitored too. Making bread by hand in cold weather is more difficult, as the dough doesn’t rise as much, yielding a denser loaf. In a breadmaker, a consistent warm temperature is maintained. With the top bread machines, all these steps are taken care of. All you have to do is measure out the right ingredients, add them in, select settings for type of bread, doneness, etc. and turn the machine on. If there is anything to be added or done in the middle of the process, you have an alert to remind you. At the end of the process you have wonderfully aromatic and fresh bread just the way you like it. These models even let you make gluten-free bread along with a variety of others and can even do non-bread jobs, like making jam, pizza dough and cinnamon rolls dough. If baking bread in an oven, you can’t delay the final baking process or keep the baked loaf warm without over baking it, while both these are possible with a top of the line breadmaker. Although some of these models are quite expensive, over time, you can recover the cost, as homemade bread is cheaper than store bought. This Japanese brand takes top prize for breadmakers and is very popular in the USA and Canada. The Zojirushi BB-PAC2 is its 700 Watt high end model that’s perfect for making a loaf of bread for 2-5 people. The machine measures 18 x 10-1/2 x 12-7/8 inches and is of a very solid build. Its unique features are the use of dual kneading paddles that ensure that all the dough is mixed thoroughly and you get a higher rise than usual, and an additional heater on the inside of the lid to ensure even browning all around. The capacity is a rectangular 2 pound loaf. You can choose from 3 different browning settings for the crust and from 10 different presets that let you make everything from plain white and whole wheat bread loaves, to gluten-free bread, to jam. You can also make just a ball of dough for pizza, bagels or cinnamon rolls, or if you want to get a crusty artisan loaf by doing the baking in your conventional oven. Want to bake a cake or make a sour dough starter? Those are possible too. Even meatloaf comes out well in this machine, as you can remove the blades, fill the pan with the mix and let it bake. If you find that you’d like to lengthen the kneading cycle slightly so that your dense flour dough rises more, or increase the time for the final rise cycle, or just bake for a little longer than the medium crust time but not as long as the dark crust time, you can set up your own program and save it in one of 3 custom memory settings to use again and again. What you can’t adjust in the temperature. When you don’t want to wait too long to eat, you can use the quick baking cycle that takes just two hours. If you want to do the final baking stage so that the bread is ready just before you eat or right after you get home from work, you can delay that stage to start up to 13 hours later. If you only want to delay eating for a little while there’s a keep warm function that you can set to keep the ready bread warm for a bit longer. There is no need to warm any ingredients, as the first default phase in the process is the “Rest” phase, where the ingredients are brought to the correct temperature and mixed before the first knead phase. Both the blades can be unscrewed for cleaning and if you don’t want to get two holes in the loaf when baking is done, you can set the timer to go off just before the final rise to lift the baking pan out by the two side handles, remove the blades and replace the pan inside the machine before closing the lid to allow the process to continue automatically from where it left off. The lid features a viewing window so that you can see its progress, and the backlit LCD clock with timer ensures that you know when the bread will be ready, as well as know when you have to add ingredients like fruit and nuts if you’re using them. All you have to do to pause the process is lift the lid, but if you want to start a program from the beginning or reset the machine, there’s a button for that. You get an 8 oz measuring cup and a dual head measuring spoon along with an instruction manual and recipe booklet. If you ever need to replace the blades or the pan, they are available to buy separately from the brand’s website. Note that the old issues of the blades wearing out after a year have been rectified and if you use the machine as it’s meant to be used, you should get quite a few years out of it. If you follow the instructions exactly as to the order in which you add ingredients and use exact measurements, you’re sure to get great bread every single time. Great loaf shape, texture and color, with slices fitting into standard toasters and any nuts and fruits evenly distributed throughout. Solid unit construction, including the pan. Relatively silent and won’t shake when kneading. Just enough settings and controls. No need to warm ingredients or bring them to room temperature before adding them to the pan. The display panel let’s you know at what time the bread will be ready even if you use the delayed start, so you don’t have to calculate it yourself. Alerts you to let you know when to add additional ingredients but does not have an automatic dispenser. Note: You can shave a few dollars from your purchase if you buy the Zojirushi BB CEC20 Home Bakery Supreme model instead of the BB Pac20 Virtuoso. The difference between the Zojirushi BB Pac20 Vs BB CEC20 is that the latter does not come with a gluten free setting. If you’re not concerned about that, it is the only discernible difference between the two. The 830 Watt Breville BBM800XL Custom Loaf Bread Maker is another expensive bread machine and comes with certain unique features. For those who like to experiment a lot and control each phase of bread making down to the most granular level, this is the machine for you. On the other hand it is also the unit to choose if you want to be completely hands off from beginning to end. Instead of the narrow and long loaf that you get with the Zojirushi, the Breville gives you a wider and shorter loaf and it has settings for 4 different sizes – 2.5 lbs, 2 lbs, 1.5 lbs and 1 lb. It also uses just one metal paddle for breadmaking, but the loaf shape justifies this. The paddle automatically collapses just before the bake cycle so there is no hole formed in the loaf and you don’t have to pause the process to remove the paddle yourself if you don’t want the hole. The paddle design has also been improved in the recent versions. You do have to be careful that it is cleaned carefully though, as any dough stuck around it will cause it to stop working. If the paddle collapses while you’re adding the ingredients in the beginning, you have to ensure that it is fixed correctly in its slot. You get a second plastic paddle for making jam. It stays fixed in the upright position throughout and does not collapse. Another unique feature is the automatic fruit and nut dispenser. You just fill up the dispenser before turning on the unit and it knows exactly when to add the ingredients on its own while kneading. So if you want to be completely hands off the entire process, you can do that with this machine. You can choose between light, medium and dark crust settings. In addition to 13 pre-programmed settings, there are a whopping 9 custom settings that you can save your own homemade program to. Every single phase of the process as well as temperature can be customized to suit you and you can save that final program to use again the future. You can make everything from basic while or whole wheat bread, to gluten free, to extra crusty, to sweet bread. The yeast free option corresponds to a quick bake, as the rise cycles are skipped. In addition to making loaves of bread, you can choose to just make dough for pizzas, sour dough starter, or even make jam. While there is no specific setting to make a cake, you can come up with your own program to do it and save it as a custom setting. You get over 60 different recipes to choose from, including cake recipes. You can delay the final bake cycle to start up to 13 hours later and you can set the unit to keep the ready loaf of bread warm for a short while. The Turn and Confirm dial is used to make a selection and start the bread making, while smart LCD interface computes how long each cycle takes and at what temperature baking takes place and displays its progress on the screen. There is a very good interior light to help you view its progress through the viewing window. If you want to pause any of the phases at any time, you press a button. If you have a specific time in mind for the bread to be ready, you can select that and the baking will start accordingly. The unit measures 15 3/4″ x 10″ x 13″ and is fairly lightweight, so tough doughs can cause the machine to shake during the kneading phases. Has an automatic fruit and nut dispenser. Every cycle length as well as temperature is completely customizable. Blade automatically collapses after final kneading, so no holes are formed in the loaf and you have completely hand-free breadmaking. The control panel is very easy to read and use. Sometimes shakes during kneading because the construction is a bit lightweight. The pan doesn’t lock down so it’s a bit noisy during kneading. Sides and bottom of loaf becomes darker that the top. Pan handle is thin and doesn’t stay in one place so it’s tricky to get the pan out of the machine as soon as baking is over and it will need to cool down a bit first. The Cuisinart CBK-200 bread machine is huge in size but is much less expensive than the above two models and offers many of the same features that they do, so it merits a close look to see if it can compare on other factors. First of all, this 680 watt appliance measures 16 x 19 x 13 inches and is the largest of these, so make sure that you have enough counter space for it. If you’re not going to use it all that regularly, it has handles on the two ends for you to pick it up and put away in your pantry. You can choose from 3 crust color settings and 3 loaf sizes – 2 lbs, 1.5 lbs and 1 lb. The unique thing about this breadmaker is that it has a convection heater, which means that the hot air is circulated around inside to ensure even baking. This also helps reduce the baking time slightly, however, if you want to make bread faster there us a “Quick bread” option where you don’t use yeast. The baking pan has a single handle and it has to be securely locked in using the metal snaps on each side on the chamber before you insert the baking paddle. It uses a single kneading paddle that you can remove after the kneading cycle and the machine will alert you when it’s time to do this. If you oil the paddle before adding the ingredients, it is very easy to remove it either in the middle or even after baking is done. There is also an audible alert to tell you when it’s time to add any mix-ins. If you want to delay the start of baking, you can set it for up to 12 hours ahead. There are 16 presets to choose from but no custom menu settings if you want to use your own times for various cycles. However this is not a problem for most people as there are enough programs to choose from already. You can make various types of horizontal shape breads, including low carb, gluten-free and artisan bread, as well as just the dough for buns, pizza, etc. There is no need to warm the water for proofing the yeast, as it will be heated from the bottom before the ingredients are mixed. A 15 minute pause function is useful if you want to check on the dough in the middle and add a little water or flour to adjust the consistency of the dough. There’s also a setting for jam. If you want to do your own dough making and use the machine just for baking, there is a bake only option, although this is more useful if you want to make things like casseroles or meatloaf in it. You make your selections using simple buttons and the LCD display shows you which program you selected and all the baking cycles as they’re being run. Lots of presets for a variety of breads. The kneading paddle comes out very easily from the done bread as well as before the baking begins. A few users say that the crust gets burnt too easily. Needs some effort to lock the bread pan in or it can pop out during the kneading cycle. Paddle must be inserted after locking in the pan. The T-Fal PF311E ActiBread is a 700 watts machine with 3 crust settings and 3 loaf sizes – 1, 1.5, and 2 lbs. It is also an affordable breadmaker. There are 15 pre-programmed settings for a variety of breads and various unbaked doughs, and for making cake, a few dishes that don’t require dough, and jam. Its claim to the top tier is its ability to make three different types of gluten-free foods, i.e. salt bread, sweet bread and cake, so for those to live on a gluten-free diet, you get a lot of value out of this machine. There are also 3 different rapid cycles – super rapid, rapid whole wheat and rapid sweet. In addition to be able to use up to a 15 hour delay start, it can also keep your ready bread warm for up to 1 hour. The backlit LCD screen displays the menu setting that you selected as well as the time left to finish. There is one kneading paddle that does a good job of grabbing all the ingredients from the edges and kneading the dough thoroughly. Once done, it is easy to remove the baking pan and the bread from the pan. A special hook is provided to remove the paddle from the loaf if it gets stuck in there. If gluten-free bread making is important to you, we have our picks for other very good bread machines that make gluten-free bread well. Very compact and good for small kitchens. Best model for those looking for more than one gluten-free option. You get fewer slices and they are large and too tall to fit in a standard toaster. Tends to brown the crust too much. A bit noisy in the kneading phase. Not enough recipes for non-gluten free breads in the included recipe book. Zojirushi: Because of the extra heating coming from the lid, the top of the loaf is as evenly brown as the rest of it. The dual paddles contribute to a good quality loaf that’s evenly textured throughout and quite fluffy. This is particularly helpful when you make breads from dense flours. The two paddles are important here because of the narrow and long shape of the pan. Breville: The bottom and sides will turn out darker than the top because there is no heating from the top. You may also find that the dark setting will cause the bottom to get too brown. On the medium setting, you’ll get a medium brown top but the bottom will be dark. With the extra crust setting, you can get a slightly crustier result but not to the extent that you may be looking for as with artisan bread. Kneading is uniform even with the single paddle because the pan is wide but not as long as the one in the Zojirushi. Since the paddle collapses on its own before baking, you won’t have to intervene to remove it to prevent a hole forming in the bread. Cuisinart: The common complaint that you see with this machine has to do with the baking cycle, however, the most likely reason for it is to do with the type and quantity of ingredients you use. While this is not that common a complaint, some users say that the crust comes out too brown and sometimes even burnt on the medium and dark settings. This is most likely because it works a lot like a convection oven although it is meant to be a true bread maker and you have to be very precise while measuring out the ingredients. You also will have better results using specific brand flours, like King Arthur’s. It is, however, a good choice if you like crusty bread. T-Fal: The bread is kneaded well and the bread textured is even throughout. However, you won’t be using the dark setting on this machine, as it offers up a burnt crust. Most will only use the light setting to get a golden brown crust. Gluten free bread comes out very well here. Zojirushi: It is designed to make a 2 lb loaf, but you can instead make a 1.5 or even 1 pound loaf. However, there aren’t any separate settings for smaller loaves. While most types of smaller loaves will still turn out well, you may have to do some trial and error in the beginning and save a custom program for them. There is a “Shape” option that you can use if you want when it alerts you before the first rise. To use it, you open the lid, take out the pan and the dough to shape it so that it is nice and even all over, then put it back in to continue. However, this is not the ideal time to shape your dough, as it’s best done before the final rise. Nevertheless, the Zojirushi makes really well shaped long rectangular loaves that’s very close in shape to store bought bread. The middle of the top does tend to rise higher unless you shape the dough before the final rise. This is because the dual blades do more thorough kneading, which creates a taller and fluffier loaf. You should also ensure that the hooks on the paddles blades point in the same direction or you can end up with some dough bunching up closer to one end of the pan than the other. Breville: It lets you make 4 different sizes and the loaf slices are wider at 5-1/2″ inches. If you like making large sandwiches this is good, but you may need to get a long slot toaster to toast the bread. Cuisinart: You get a standard bread maker shaped oblong loaf with this machine, so it’s not just like grocery store slices. However, the slices are good for making sandwiches. You may find that the top rises a bit too much inside if you’re making a 2 lb white bread loaf, but other types of bread will be fine on all sizes. T-Fal: A 2 pound loaf will produce very large slices. If you want toasted slices, you’ll need a toaster that can accommodate the rather large slices or do it in a toaster oven. If you’re OK with making smaller loaves each time, make 1.5 or 1 lb size loaves to get slices that fit in a standard toaster. There is no way to remove the paddle before the dough begins baking, only after the bread has been baked. Therefore, you will have a hole in the bottom of the bread but it’s quite small and shouldn’t be too much of a problem. Zojirushi: You get a good number of settings without overkill. For most people the 3 custom program settings are enough, as the pre-programmed ones are very good and take care of any type of bread that you want. Breville: For the most granular control on every phase, this model beats all the others and you can save any custom program you come up with because it has room for 9 of them. Cuisinart: This one features the most settings, so you probably won’t use all of them, but they are all very easy to use. You can’t customize any programs, so if one setting doesn’t work for you, the only option you have is to find another recipe or try a different setting that you think might work for your existing recipe. A foolproof recipe that should work in most bread machines is this one from King Arthur Flour’s website. T-Fal: There is no setting for basic white bread but you can use the French bread setting as long as you like crusty bread. While there are numerous settings provided, those who like only regular types of bread will find most of them quite useless. However, gluten-free eaters will like the additional settings for them. Zojirushi: While the control panel may not be completely intuitive for beginners, it is quite easy to use and difficult to get a bad loaf of bread. The only drawback with the two paddles is that you have to remove them at the right time if you want a loaf without paddle holes. This is easy enough if you spray them lightly with oil before adding ingredients and jiggle them a bit to remove them from the dough. Everything is easy to assemble and clean if you just soak the inside of the pan with warm water and a drop of liquid detergent for a little while first. Breville: This is also easy to clean if the paddle is first immersed in liquid detergent and warm water. Once removed, the paddle is best washed with warm soapy water. This ensures that it lasts a long time. The control panel is intuitive and the display very easy to read. It is the only model that allows for a complete hands-free breadmaking experience if you want bread with fruit and nuts in it or a loaf without a hole. The interior light makes it easy to view the inside. The pan handle is rather thin and flops to the side instead of staying up, so it’s not easy to lift the pan out of the machine when it’s very hot using an oven mitt. Cuisinart: This machine is very easy to use. You get audible alerts at the important stages if you want to add mix ins, remove the paddle or adjust ingredient quantities. The 15 minute pause function helps with that. Cleaning is very easy. The only difficulty you may have is when you have to fit the pan inside the chamber and lock it. You have to press firmly and ensure both the metal snaps secure the pan or it will come loose during kneading. The LCD panel is a bit hard to read if there’s not enough light, as it is not backlit. T-Fal: The display screen is not backlit, making it hard for some to read. Those who don’t care for the gluten-free recipes will have to look for their own recipes, as the included booklet doesn’t cover enough regular bread offerings. The ready bread releases easily from the non-stick pan but the paddle tends to stay inside the loaf and will need to be extracted, which is easy enough if you use the included hook. Washing up is easy too. Zojirushi: The Zojirushi is the most durable of bread machines with a solid construction that justifies its price. Its large footprint and heavy weight ensures that it will stay put even when kneading extra heavy or dry dough. Breville: This machine has slightly flimsy construction and is lightweight but tall so if your dough is a bit dry or dense, there’s every chance of the machine shaking and moving about on the kitchen counter. However, it is a durable enough unit. Cuisinart: There are no complaints about durability and you should get your money’s worth with this machine. T-Fal: The unit is quite stable even though it has the smallest footprint of this bunch and is durable enough. Zojirushi: It is the most expensive bread machine of the bunch but pros will tell you it makes the best bread, so if that’s the top priority and you make bread several times a week, then it is worth it. Breville: Only slightly less expensive than the Zojirushi but control freaks will love the amount of adjustments you can make. It’s also a worthwhile for anyone who wants automated bread making from beginning to end and without a hole in the loaf. Cuisinart: Its price is the big plus point here. For very similar features to the Zojirushi and Breville models, you get a reliable bread maker that makes decent bread as long as you find the right recipes and stick to them to the T. Baking experts might not like the lack of control. T-Fal: This is another very affordable bread machine that makes good bread as long as you find the right recipe and don’t mind dark crusts. It especially gives great value for gluten-free eaters.